Depicting ship models in the environment we landlubbers usually get to see ships – in port – was always on my mind since I restarted building ship models in 2004. British and Canadian escorts from World War 2 have always been of interest to me, hence the project should have a British subject. Jim Baumann and Peter Fulgoney having presented their excellent harbour dioramas in 2006 precluded choosing a similar scene in order not to wear the subject out. By coincidence I found various plans of British docks and harbours while doing internet research. Luckily these plans included scales, so I was able to convert the dimensions. 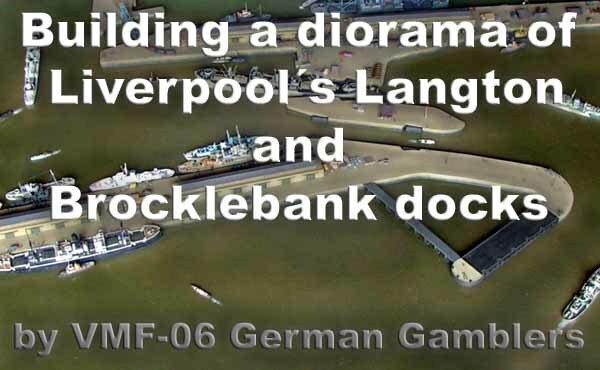 Poring through these plans, the double access to Liverpool´s Langton docks, one of the numerous docks along the river Mersey, appealed to me ever more. Getting the measurements and converting them into 1:700 scale soon showed that a decent depiction would take up an amount of space that was hard to cope with for a single modeler in a given timeframe. But what are friends for after all, especially friends that share your interests? In the spring of 2007 I presented my idea to my friends Frank Ilse, Guido Hopp, Dirk Mennigke and Torben Keitel. As Guido and Torben both have an anglophile strain to them, they soon agreed to cooperate on this project. Frank and Dirk prefer 1:350 scale and planned to execute a project of their own. We soon agreed that both projects complemented one another and could be presented simultaneously at our display. As I already had a certain scene in mind, I continued research into the story we meant to tell with our diorama. Guido and Torben researched into dock structures and buildings. Later on in the project, our new member Frank Spahr joined our group and the diorama project. Each diorama has to tell a story. In our case we meant to depict how merchant vessels and escorts enter the port after completing a convoy voyage. That said, we needed to chose the timeframe, the convoy and the individual vessels involved. The excellent web resources Convoy Web and the Württembergische Landesbibliothek both offer comprehensive data on naval warfare 1939-45, and here I found the necessary information to determine the composition of our diorama. The diorama was to show some of the vessels already moored in port, with others in the process of entering port, depicting them in various phases of the maneuver. Moreover we meant to include various tugs, trawlers and other working vessels as only these really bring a port scene to life. Having agreed on the scene to depict, we needed more research into the dock structures. Guido worked hard and obtained photos and information on the Liverpool docks that gave us a fairly good idea of how these docks looked between 1929 and 1955. The section we intended to build was a part of Langton and Brocklebank docks. Various warehouses and other buildings were identified, as well as a swivel bridge and a jetty built in front of the actual entrance to the dock. A host of other questions had to be answered: How was the water to be simulated, how high were the quays and how were they actually built, and - most important of all: Which items were available in kit form and which had to be scratchbuilt? We soon agreed on the timeframe as we meant to present the diorama at Scale Model World 2008, held in Telford on 15/16 November 2008. We soon knew what could be obtained in kit form and what had to be scratchbuilt. The quays, bridges, locks and the jetty would have to be scratchbuilt. Warehouses and vehicles were available from Battlefleet Models and White Ensign Models. Before we finally were able to start, we needed to assign the work amongst the group. Frank and Torben built the only destroyer, HMS Hesperus, plus the corvettes HMS Heather and HMS Saxifrage. Torben also built the small swivel bridge. Guido and I divided the remaining vessels amongst us, with Guido building the Empire freighter SS Empire Pibroch, the corvette HMS Clematis, the sloop HMS Totland plus the trawler HMT Kirkella. That left me with two freighters, the Hog Islander SS Shikshinney and the tramp SS Fjordheim; moreover I built the corvette HMS Campanula and two trawlers – HMT Indian Star and HMT Inkpen. The numerous other small vessels and vehicles were left aside for the time being. Guido also undertook building the jetty, and I took care of the display itself, the docks and buildings. Even though this diorama is a team project, most working hours were spent in our individual workshops. We held four meetings throughout the building process, yet hardly ever with all the participants being present due to work or other commitments. In the first meeting held in March, 2008, we agreed on the positioning of the vessels and discussed how to fabricate the dock structures and buildings and how to simulate the water. Already then it was clear that Torben would not be able to got to Telford due to professional commitments. The ships were built between the fall of 2007 and the fall of 2008, actually the last vessels were completed just in time for the presentation. As we knew which paint schemes and which equipment to use on the escorts, building them was a straightforward process. Only Frank had to do extra work on his Hesperus, as there is no kit of this vessel in her 1943 fit. He therefore had to kitbash Niko Model´s ORP Garland kit with B-Resina´s HMS Hero. All the corvettes and sloops were built using the WEM and HP Models kits, same as the three trawlers. The trawlers are based on the HP Vorpostenboot V 1102 kit and received major modifications to resemble British vessels. The Empire freighter was based on the HP Models kit, whereas the Hog Islander was built using Battlefleet Models excellent kit. The tramp steamer is based on Loose Cannon´s kit of the SS Dayrose. All models were detailed and improved. All resin masts were replaced with brass items. Watertight doors, hatches, vertical and inclined ladders, railings, radar's, davits and the like were taken from the various photoetched sets produced by WEM, L´Arsénal, Lion Roar and Tom´s Modelworks. Various items were replaced by resin parts, such as Niko´s hedgehog launchers. Styrene stock was used for conversions, such as Hesperus and the trawlers. All the models were painted and weathered as per our references. With the freighters, we chose to use various shades of grey plus a peacetime scheme for the tramp. In order to keep the diorama manageable to work on and to transport, we agreed on a size of 700x550 mm (27.56 x 21.65 in); a rectangle of that size was overlaid on the plan and the section thus chosen and defined. We intended to keep the dock structure as simple as possible, and we were helped by the way the Liverpool docks were built. They consisted mainly from cast concrete, with their fronts lacking any of the reinforcements so commonly found. The Mersey´s mean tidal range exceeds 7 meters (23 ft), and this is what the docks are built for. So we decided on a visible height of 8 mm (.31 in) for the docks, which translates into 5.6 meters (18 ft 4 in) and should be correct for a median tidal range. Making docks from 8 mm styrene stock sounded easy at first, but it soon proved to be pretty hard to achieve crisp cuts in styrene of that gauge, let alone in the length needed. While discussing the issue with modeling friends the idea of computer assisted milling turned up. Coincidentally one of the friends, a free-lance designer, owns a 3-axis milling machine that could make quick work of the job needed. Having already designed the docks using CAD software made conversion into *.dxf format and importing the data into machine easy. Within a few days I had the crisply milled parts at home. For an attractive presentation, a base plate was cut from 19 mm MDF, and an ornamental frame was crafted from beech. The latter was stained and polished. The base plate is fixed to the frame with screws, enabling us to use the frame for other future projects. It was only fixed to the frame after all other work was completed. After removing the dock parts, their edges were cleared up lightly. To keep the whole setup flexible, the dock elements and the main buildings were to be screwed to the base. Hence, the sections were aligned, temporarily fixed to the plate, holes were drilled and threads were cut. After finally determining the buildings positions, they were treated likewise. The prominent lock gates at the docks entrance were scratchbuilt from styrene stock using photographic references. The handedness of the gates necessitated making a pattern for both a left-handed and a right-handed gate. Molds were made from the patterns and the required number of parts was cast in resin. Upon our second meeting in July both the base and the dock elements were completed; that made finalizing the vessels positions easier. At this meeting we decided on how to simulate the water and agreed on the further schedule. Most of the vessels built by Torben, Frank and Guido were completed at the time. Until the next meeting scheduled for early September I had to perform a lot of work on my ship models. Already then I decided not to implement one of the vessels planned originally. Guido and Torben could not participate due to professional commitments, so Frank and I made the water and continued on other aspects of the diorama. Torben had visited me before to make sure the swivel bridge did fit. We realized we would have to do some adjustments to the dock to fit the bridge. Main issue of the third meeting was making the water. We used a method Frank had successfully executed several times before. To correctly replicate the shade of the Mersey and the water in the docks – a pleasant muddy multi-hued green-brown – we consulted Google Earth´s satellite view. The dock entrance still exists, even though many of the docks have been demolished or backfilled. The first step was brushpainting the base in an appropriate basic hue, using liberal amounts of wallpaint stippled on to give the surface some structure replicating the ripples of the water. That cured, the contours of the docks and vessels were marked and masked. Using two airbrushes, we then applied various shades of green, grey and brown, always trying to simulate the effects caused by currents and the movements of the vessels. Vallejo´s ModelAir acrylics proved to be ideally suited to blend the shades nicely. After we were content with the result, we sealed the entire water area with several coats of clear gloss lacquer from a rattle can, taking care not to overdo the gloss. We concluded this days work with priming the various buildings and vehicles. Bringing a diorama to life needs many small elements. In our case this meant assorted buildings, tugs, vehicles, cargo, figures and so on. We divided this work amongst us. Frank produced assorted cargo like piles of boxes, heaps of sand and coal, winches, train engines and cars plus military goods stored on the quays. Guido built around 110 freight cars, train engines and lorries. Torben built several tugs, barges and other working vessels, and I had about 50 lorries and various cargo on my workbench – plus the docks and buildings! Painting and weathering all this took several evenings and weekends. We only used acrylic paints, weathering was done using artists oil paints and pastel chalks. Having completed the docks and buildings, they could be fixed to the base, with the lacquer having had ample time for curing. A first trial using available elements and vehicles showed a need for considerably more details. So quayside lamps were made from brass wire and white glue. Moreover, a collection of cutters, barges and rowing boats were taken from numerous detail sets; they were painted, weathered and spread around the diorama. Inclined and vertical ladders as well as working rafts brought additional life to the scene. The swivel bridge was also finally fitted and fixed to the base. On the quays, railroad tracks were marked. In the meantime, Guido worked hard on the jetty, a focal point of the diorama. The first in-progress images he sent showed extremely delicate PE structures and let my excitement mount. Guido and Frank painstakingly painted 1:700 PE figures, ending up with about 3,000 of them. Apart from all the docks, buildings, vehicles and so on, my ship models were completed by the end of October. So the road was clear to a final meeting to complete the diorama. Frank and I met for the final building session. Having fixed the quays and main buildings, we had to add the smaller buildings, vehicles, small items and figures in lively scenes. After several rehearsals we were contented with the result and started fixing the elements to the base. White glue was used to enable us to remove the pieces, only the 300 figures were super-glued. Yes, only 300 of them. Alert readers will wonder why we left 2,700 figures out. But those 300 figures brought so much life to the scene that less seemed more. We will surely use the remaining figures some day. To add more realism, we needed moorings and tow cables. These were made from copper wire to be as flexible in regard to the ships positions as possible. Fitting the delicate jetty to the quay was an exciting moment. Guido had built the parts only using the plans I had provided him, without any access to the actual parts. Nonetheless it was a perfect fit – so the CAD plans have worked well. All the while we made travel plans for our trip to Telford. Ferry, hotel and a van had to be booked, as well as the itinerary and our registration for SMW 2008. Frank Ilse and Dirk Mennigke had almost completed their diorama project – it was two weeks to go to SMW. Whereas Frank had decided to leave his vessels on the diorama, and I had to make a transport box for my vessels. In the afternoon of 14 November, the exhibition halls were opened to set up the show. After assembling our stand, we finally were able to unpack and assemble the diorama with all the vessels. Everything fit and went according to plan and – most important of all – as we had envisioned. Our depiction of the Liverpool docks was easily recognizable and more than a few visitors said these are Liverpool Docks aren't they“. We very much appreciated that, as it showed that we had replicated the original in a fair way. After numerous images showing individual components and the progress of work, here are some images of the completed item from various perspectives. Click the image on the right to see the finished product.